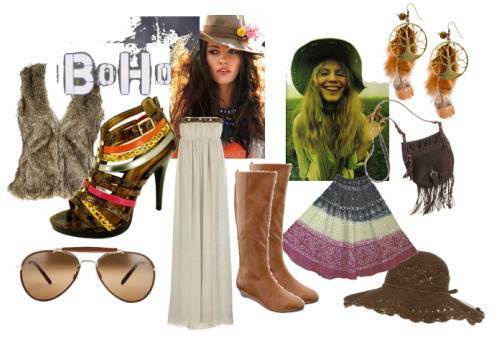 Boho or bohemian fashion style is a fashion concept which is inspired by nature element. The bohemian fashion is typically free. It means everyone can express their own style while dressing boho chic. This kind of exotic and free fashion style is commonly signed by the appearance of loose and float skirt, cropped jacket or vest, embroidered tunic, Western boots and beaded jewelry. The bohemian fashion style is also associated with gypsy fashion style as well as hippie dress code. No wonder that the sense of peace and love is displayed crystal clearly on the boho outfits. Here we are going to introduce several boho matching outfits to inspire you. The most crucial thing here is to always ensure your comfort in dressing boho chic. Since you feel so comfortable in dressing, any boho outfit will look perfect on you. Since it is summer, a simple long dress with pattern is enough. This simple dress can be an exotic sundress which accompanies you during the summer break. This long patterned dress should have such tribal motif on the entire surface. And try to choose a dress with dark and light tone composition. These tones combination can bring much natural scent on your fashion. In addition, we can match this simple sundress by wearing beaded necklace and bracelet with similar tone gradation like the dress. And don’t forget to wear a scarf to cover your hair. A pair of leather gladiator flat shoes looks very incredible with the dress. Or we can wear moccasin or Cowboy boots to replace those gladiator shoes. Wearing a wide leather hat can carry much bohemian accent onto your appearance. It will be much better to match this hat by wearing leather knee-length boots as the footwear. If you want to look simpler, light rattan hat with wooden bead ornament is a nice to match your mini float skirt. Carrying a brown leather message bag with some tassel details will perfectly complete your fashion dressing boho chic. For your formal boho fashion style, it becomes more effective to choose a float or loose dress with fewer embellishment or detail. Appearing simply in blush boho dress seems very fancy on you.